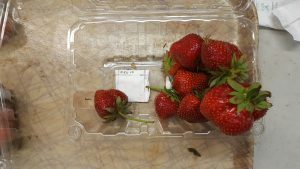 To demonstrate that our two-component packaging technology will extend the fresh strawberry market season in the Northeast, and will improve inventory management allowing for berries to be picked for later use or in advance of bad weather. Harvesting of all fresh berries would allow for less wasted production left in the field resulting in more efficient land use and production. Strawberry harvest in the Northeast is limited to a three -week period on average. There is a need to extend the season for growers. One way to extend the season is to contain postharvest losses. Currently, there is no postharvest treatment for strawberry. In the northeast, most of the strawberry production is for the fresh market with 3,911 acres in production. The total value for strawberry production is $34.52 million. To solve this problem, we have developed sachets containing essential oils encapsulated into cyclodextrin (CD) which are fitted to clamshells to control disease. Thyme oil is known to control gray mold and other fungal diseases. These sachets are combined with modified atmosphere packaging (MAP) to prevent water loss of fruit. This project will bring the technology to the strawberry grower, demonstrating increased fruit freshness and storage life by evaluating disease, fresh weight and fruit firmness, for postharvest treatment with anti-microbial sachets and MAP compared to conventional storage, and through surveys after taste tests by farmers and consumers. Incorporation of our postharvest technology will improve freshness and quality and extend product shelf life. Controlled release TyvekTMsachets of thyme oil (TO) or oregano oil (OO), encapsulated by b-cyclodextrin (CD) at a ratio of 16:84 were made. Clamshells were fitted with 2 sachets (0.5g TO:CD) each. MAP bags and CO2 emitters were purchased from Multisorb (Bridgewater, NJ). 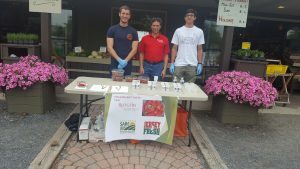 Strawberry fruit were harvested from three local commercial sources and either transported to the laboratory at Rutgers University, New Brunswick, NJ or stored at harvest location. The fruit were sorted so as to select only well formed, rot free, unblemished fruit with intact calyxes. Units of approximately 20 fruit were selected and placed in clamshells outfitted with TO:CD or CD sachets. The clamshells fitted with sachets and fruit and some were sealed in MAP bags. Two CO2 emitters were included with the fruit sealed in MAP bags. ibutton data loggers were used. The samples were stored at 4 °C and 90% RH and tested at day 7 of storage. Change in package weight for the different treatments of strawberry was measured over storage time. A hand held fruit pressure tester (FT 011, Mc Cormack, Italy) fitted with a 3 mm plunger tip was used to measure fruit firmness over storage time. The total soluble solids (TSS) content of the strawberry homogenate was measured with a portable refractometer (Fisher Scientific, Suwanee, GA, USA). The results were expressed as degrees Brix. 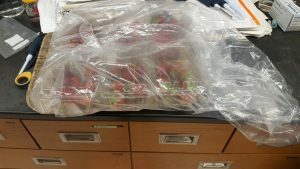 Gray mold was visually estimated in each individual fruit right after opening the packages. Strawberry fruits showing surface mycelial development were considered decayed. The results will be expressed as percentage of fruits infected by Botrytis. A taste test was performed on the fruit after one week of cold storage. The taste test was performed at three different locations. There were a total of 76 participants. Participants were given a fruit from selected treatments and asked to rate the fruit from 1 to 5 with 5 being the best for freshness, aroma, sweetness, and flavor. Participants were also asked which treated strawberry would they buy. Data for the physical, chemical and microbiological parameters was subjected to 2 way anova without replicate followed by post hoc Bonferroni comparison to test significant differences between means with p<0.05. The proof of concept will be considered successfully achieved if the treatments are statistically significant compared to the controls. 4 cm x 4cm TyvekTMsachets were filled with TO:CD prepared from a ratio of 16:84 TO:CD and heat sealed. Alternatively, 4 cm x 4cm TyvekTMsachets were filled with 0.5g CD (control) and heat sealed. Two sachets were adhered to the bottom of a clamshell package and 20 strawberries were added. Some of the clamshells were then enclosed in MAP bags with CO2 emitters and placed in a 4 °C cold storage room for 7 days. Each treatment had six replicates and was repeated three times. The results are shown in Table 1. The result from Table 1 indicate that fruit which is stored in MAP bags has less weight loss than fruit stored in clamshells alone. The MAP bags had no effect on disease, firmness, or Brix. The essential oils, thyme and oregano, had no effect on weight loss, firmness, or Brix. Thyme and oregano oil alone had no effect on disease. The combination of MAP and oregano oil was not effective in preventing disease, but the combination of thyme oil and MAP was effective in curbing decay losses. 2018 was a very wet year and it is very encouraging that the combination of essential oil and MAP significantly reduced fruit decay in stored fruit. Three taste tests were performed at three different locations. Strawberries that were either freshly harvested or stored for one week with either CD, TO:CD, or OO:CD were used for the taste test. Participants were given a numbered cup fitted with a strawberry. They were ask to rate the berry for freshness, aroma, sweetness, and flavor. Between treatments, participants were asked to clean their palates with water. The results for the taste test are shown in Table 2. Participants were also asked which treatment would they buy. The results are shown in Table 3. The results from Table 2 indicate that participants could not discern differences in freshness, aroma, flavor, and sweetness between the different treatments. While there were not any differences in organoleptic properties, participants indicated that they would be more inclined to purchase freshly harvested strawberries compared to the stored fruit (Table 3).